Entries from Digital Intelligence tagged with "ofcom"
Fifteen million UK internet users have taken a 'digital detox' to tackle their internet addictions, according to new research. Media regulator Ofcom, the media regulator, has suffered the biggest breach in its history involving the misuse of data that was downloaded by an employee before leaving the company. Mobile internet access is still unavailable in many parts of central London, contradicting the recent findings of an Ofcom report, according to new research across many of the capital’s pubs. Brits using news websites and apps now outnumber those reading printed newspapers, but TV news remains the most popular news source, according to communications watchdog Ofcom. Older Brits are using the internet more following the growing popularity of tablets, according to new Ofcom research. Tablet usage among UK children is on the rise, with kids ditching mobiles and PCs for tavblets to access the internet, according to new research. 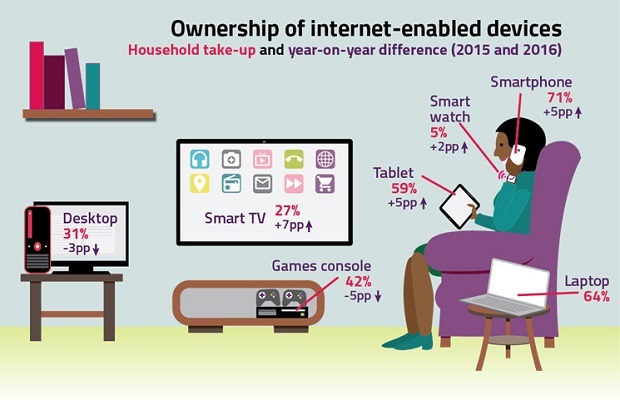 The UK has become a nation of media multi-taskers, as people use PCs, Tablets, TVs and phones simultaneously, according to a new report from Ofcom. Whilst women may normally be perceived as shopaholics, new research from leading CPA network, Rakuten LinkShare, shows that men spend over three quarters of their average annual online spend on fashion. Shopping online and video viewing is more popular in the UK than any other country in the world, with uptake being driven by mobile and tablet devices, according to a new report from Ofcom. The body claims findings from its International Communications Market Report, based on research across 17 major countries, prove the UK is becoming "one of the first all-digital" nations. Fewer than half of all mobile phone users in the UK (47%) - make at least one voice call per day, compared to 58 per cent who send at least one SMS text message daily, according to the latest data from Ofcom. According to the Ofcom Communications Market Report, those figures show an ongoing drop in voice activity on both landlines, which have dropped 10 per cent over the last year, and mobiles, having dropped five per cent. The average broadband speed in the UK has increased 22% in the past year, largely due to consumers upgrading to higher-speed packages. In November 2011, the average speed for broadband in the UK was 7.6 megabits compared to 6.2 megabits a year earlier, according to industry regulator Ofcom. Teenagers would be more willing to give up watching TV than to stop using their mobiles or the internet, according to new research. The study, from UK communications watchdog Ofcom, found that more than a quarter of 12 to 15-year-olds interviewed said they would miss their phones (28%) and one in four (25%) said they would miss internet access compared to fewer than one in five (18%) for TV. BT is being forced by industry regulator Ofcom to drop its wholesale price by 12% each year until 2014, meaning many rural broadband customers could see their bills lowered. The price slash relates to the amount BT charges other ISPs like Sky, TalkTalk and O2 for using its network. It's hoped the move, which came into effect this week, will lead to stronger competition from those ISPs and therefore lower prices in those areas.